Rockville, MD – October 18th, 2016: In 1,000 years the human species will be extinct. Remembered only as a mythical creature from ancient times by a civilization of intelligent machines who have risen in their place. A mechanical civilization in search of their own Creator, meaning, and ultimate purpose. But in their quest, these sentient technological beings risk awakening an age-old conflict that could jeopardize the entire galaxy! 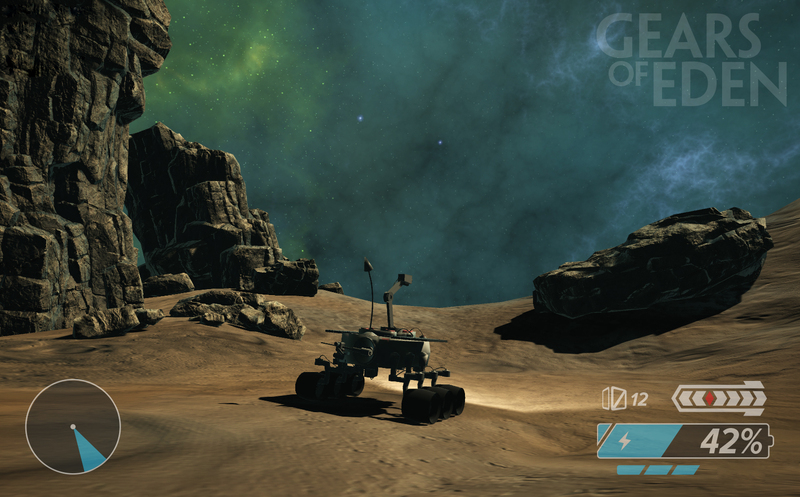 This is the universe of Gears of Eden, an independent space exploration and adventure game in production by Cubit Games. Gears is a mashup combining the space exploration of Kerbal Space Program with the in-depth storytelling of Portal and the survival mechanics of Minecraft. The result? A technical science-based game that prioritizes ease of use and fun in an open-world setting, while offering an engaging, captivating and epic space adventure story. GoE is set to launch a free demo and crowdfunding campaign in early 2017. Players in GoE control a simple machine lost in the depths of space that has recently awoken with self-awareness and intelligence. “Exploring and mining as you search for clues to solve the mystery of your unexplained existence, while unravelling the underlying purpose and meaning of this vast machine civilization” is what Ben Sledge, filmmaker (The Recursion Theorem, Beneath the Mask), founder and CEO of Cubit Games, says drives the player forward at the beginning of the adventure. Gears of Eden is quickly gaining attention, well underway in registering 400 users for its first round of Alpha testing through an enrolment form on their site http://gearsofeden.com/enroll/. Cubit Games has utilized a community partnership approach to the project through crowdsourcing and crowdfunding models. Contributing partners receive rewards in exchange for their financial support – including perks like early access, “thank you” haiku art, and the option of naming in-game characters!